Local Hero, easily one of all the time great British films, is a kind of magic realist fairy-tale in which nothing magical happens in the traditional sense of the word. That’s not to say, however, that the film doesn’t inspire awe with its dry whimsy, profound modesty and modest profundity. The tale is a rather simple one brought to us by Bill Forsyth, director of Gregory’s Girl. Ferness, a rather quaint and charming, remote, picture-esque Scottish village, is to be replaced with an oil refinery if Texas' Knox Oil (headed by Burt Lancaster’s Felix Happer) get their way. 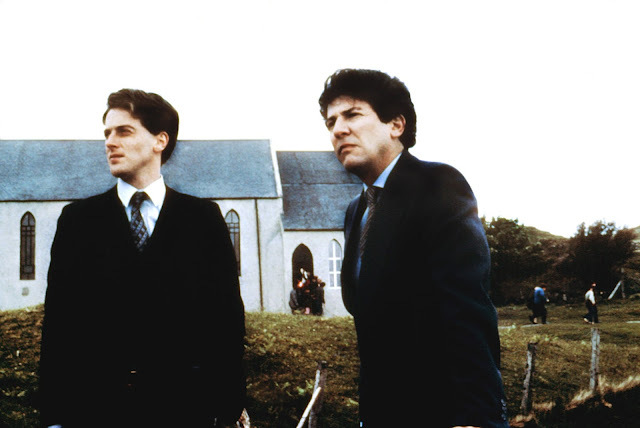 To complete this mission, an employee named MacIntyre (Peter Riegert) is dispatched as a representative of the company to go broker the deal with the locals and also report back to Happer any sightings of constellations or peculiar activity in the sky. Teaming with locally based Knox employee Oldsen (Peter Capaldi), MacIntyre hopes to complete the deal as expediently as possible and return to Texas a conquering hero. What nobody, least of all MacIntrye, bargained for are the peculiar events that he will encounter when he reaches Scotland – there’s a potentially magic rabbit, the possibility of a mermaid and, most of all, a quiet and quaint, tranquil town in which the words “neighbour” and “community” have yet to become alien concepts. MacIntyre falls in love. From here there's a real mystical stillness to what unfolds as we watch Mac discover a new way of living through wide, innocent eyes - this place is a world away from the life he's used to back in the States, the hustle and bustle of the big city and the board room, and it's only upon experiencing this that he begins to quietly question himself about the life he should be living. Yet, Forsyth is too skilled a film-maker to slide into contrived melodrama here – the majority of the village Mac is dealing with are hardly idealistic and make no bones of the fact they want the American’s money and as much of it as possible. There’s no evil oil baron either, as is often the case in films like this, but rather a peculiar Happer who seems to be conducting big business simply because that’s the only life he knows. Looking for something to constantly energise him, he’s taken up abuse therapy and astronomy with equal gusto. The only person who won’t make good on the deal is a beach dwelling eccentric (Fulton MacKay) who seems content with his place on earth - he's the only one who doesn't think the grass will be greener with a new lot in life. How, then, can Mac complete the deal if he can't secure the purchase of Ferness' beach? Local Hero is a movie which feels like Powell and Pressburger at their most humanistic. It’s rare that such a deeply personal film finds its way on to the screen and, as such, its equally rare that movies can inspire such personal feelings too. It’s a cinematic love letter filled with flowing prose which woo and soothe with ethereal grace. It's innately British too – it’s neither obtrusive nor brash with its emotions at any point, no hearts are worn on sleeve, in fact everything is rather beautifully understated; it's a patient movie in which characters gradually present themselves over the course of a series of slight, human interactions. It seems embarrassing for a film so unassuming, to decorate it in superlatives but it would also make a great disservice to Forsyth’s magical movie to not describe it in anything less than warm, glowing terms. It’s not hard to be enchanted by a film that looks and feels this beautiful – the camera captures nature and human nature equally at its most magnificent. The narrative is slight but the endearing moments of human interaction which slowly, ever so slowly, nudge the film forward swell the movie with grandiose warmth. Yet this is not to stay that the film is full of unadulterated joy - indeed the ending is a bittersweet and haunting one. Mac and Happer both seem to want for little in the way of material possessions yet both clearly feel hollow - Happer tries to fill this void with abuse therapy and astronomy; whilst his bank account can’t fill his soul, perhaps a telescope and the night’s sky can. It’s staggering how the busiest of lives, those surrounded by constant noise and people, can often be the loneliest. But what's truly depressing is the fact that Mac didn't realise how empty he felt until he went down the rabbit hole that is Ferness - having experienced this though, there's no real going back to his old one; something changes inside of him immutably. As the film climaxes, Mark Knopfler’s spine-tingling title music growing and swelling, it’s impossible to feel not unmoved by seeing something so much bigger than ourselves, like Happer glowing under the aurora borealis. It’s an enchanting movie which mythologises itself in the viewer’s mind as it plays out – each second ingraining itself as part of an instantly timeless and unforgettable experience. The most powerful image, however, is the last one in the entire film in which Mac dials Ferness' phonebox to re-connect with a special time in his life. The phone rings and rings patiently - it's an act of faith unacknowledged by the heavens, a prayer unanswered, and a final moment which moves the film from Powell and Pressburger territory into a tone more familiar with Billy Wilder. It's a truly magical, deeply philosophical story, the types of which are magically rare in cinema.